After nearly five years of marriage, Chinese actress Yang Mi and Hong Kong actor Hawick Lau have issued a joint-statement announcing their divorce. 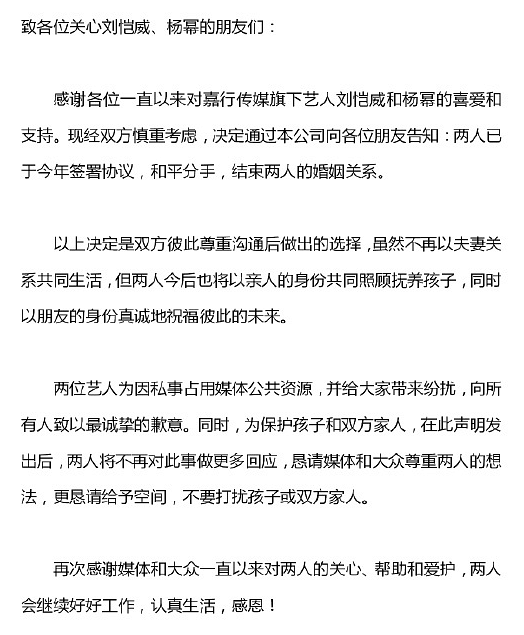 The statement, which was released by Chinese entertainment and media company Jiaxing Media on Saturday evening (Dec 22), said that both parties signed the divorce papers earlier this year and have separated amicably. The divorce was a decision made by both Yang, 32, and Lau, 44, after a discussion "conducted with mutual respect". Said the statement: "Although the two may no longer be living together as husband and wife, they will act as family members from now on to care for and raise their child." "As friends, they also sincerely wish each other the best for the future." Yang and Lau have a four-year-old daughter Xiao Mi, whom they have nicknamed Xiao Nuo Mi or "Little Glutinous Rice". Rumours of Yang and Lau's divorce had surfaced in recent years but the couple always denied the rumours. For instance, they did not publicly celebrate their third wedding anniversary in 2017. When asked, Yang replied: "We have our way, why do we have to tell everyone?" Yang tied the knot with Lau in January 2014. Barely a week after their Bali wedding, the actors confirmed that they were expecting a baby in July. The pair had met on the set of the 2012 Chinese historical drama, Ru Yi. Yang achieved mainstream success with her role in the 2011 hit period drama, Palace. In 2017, Yang ranked third on the Forbes China Celebrity 100 list. Lau was named by Hong Kong television broadcasting company TVB as one of the Five Fresh Tigers - a group of promising young actors - and is best known for his performances in TVB series A Kindred Spirit (1995), Virtues of Harmony (2001) and My Family (2005).